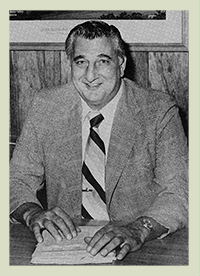 K. Kiki Konstantinos was the superintendent of the Lenape Regional High School District for more than 30 years. Under his guidance, the district maintained a reputation for excellence in academics, interscholastic sports and student activities. All students of the Lenape District, which currently includes Lenape, Shawnee, Cherokee and Seneca, received an education that prepared them not only for higher learning and the world of work, but also for citizenship in their communities. Former superintendent Konstantinos' mark is indelible, carried on by the continuing tradition of excellence in the schools of the Lenape District and, most importantly, by the generations of students who passed through their halls. Over 40,000 students were educated under Mr. Konstantinos' leadership as superintendent. In honor of his accomplishments, the Konstantinos Scholarship Foundation is dedicated to continue to foster excellence in education in the entire district through the awarding of individual scholarships to outstanding students for higher education.